So, you say you’re a knowledgeable gambler, eh? Well, I have found 20 slang words used in the casino by players, dealers, and pit bosses – some simple, some rather esoteric. Let’s see what you know. I dare you to take this matching quiz and comment to us at NETime Gambling on how well you did. Match the green answers to the red words to the left. Answers Tomorrow. I made it easy – matching! But, there are more answers than questions, so make sure you check all possible answers A-Z. _____1. 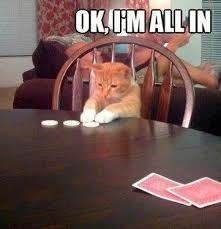 an Ante A. a bet in poker placed before player sees any of his cards. _____3.The Blind C. casino lingo for 10 dollar bet. _____4.a Buck D. a forgotten table bet originally wagered by the player. _____9.Barber Pole I. a bet required to start at hand in card games. _____12. a Fish L. a drunk player. _____14. Martingale N. a net profit after all gambling expenses deducted. _____16.a Railbird P. the Joker card. _____20.a Ploppy T. a player who is not knowledgeable about the games. U. a wagering system where the player doubles up after every loss. W. a non-tipper. X. a single dollar. Y. means a player and a banker have a similar two-card or five-card hand especially in Pai Gow poker. 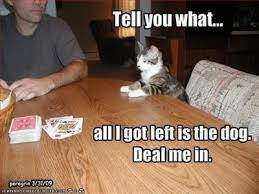 Just about everyone tries gambling of one form in their lives. Some involve money, others may gamble at running a red light. Each has its own degree of risk and consequences. There are professional gamblers who have been able to gamble for a living and not fall into the dark side of addiction. These Advantage Players, or AP’s, know the importance of knowing how they react to the rush of winning and the down side of losing. But professionals also detach a lot of the emotion – it’s a business – which helps keep those fiery endorphins more stable. Most humans can gamble, whether money based or consequence based (or both) without concerns, but some have trouble when any gamble turns into habit – especially casino gamblers. 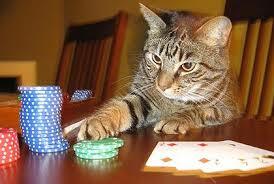 With the help of the “NETG Gambling Cats.” this post includes simple tips and a few items to help responsible gambling. While many have a fun, exciting gambling experience without them, these tips and forms may be something to consider. 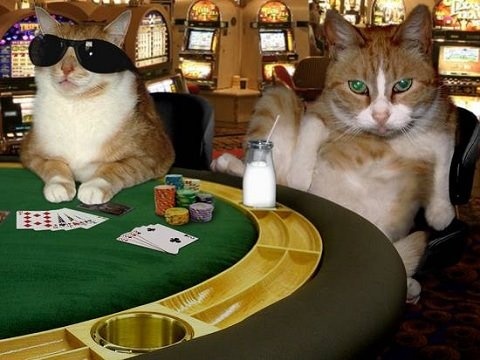 As far as the cats know, they are the “purr-fect” answer to responsible gambling. Take a look at the following tips; they’ll help you to learn more about how you can enjoy gambling without putting yourself at risk for problem gambling. Know how much it costs to play per hour on the games you enjoy. While you win sometimes, you also lose, so it is important to know the average cost per hour. Click HERE for your free chance to calculate your own cost of play, provided by the Addiction Foundation of Manitoba. What is your reason for gambling? Don’t know? You should. Be aware of your own reasons for gambling. Remember that, while gambling can be fun, it is not a way to solve problems, get away angry, or spend time depressed. Have fun, enjoy time with friends and family. Make it something you would do again with no consequence. Balance gambling with other leisure activities.Gambling shouldn’t be the only activity you do in your spare time. Other activities can blur into other casino events, such as culinary interest, music performance, and sports. Finally, if you gamble on a regular basis, keep track of the money you spend. Most people would never think to keep track. It’s no fun to track your gambling, and lets face it, most of us are just TOO lazy. Statistics don’t lie. Print out the NETG Gambling Log 3 to keep track – it will help you to keep a realistic record of your gambling expenses. Please note: The above log is not to be used if you claim gambling losses for your taxes. A much more specific log of your gambling is needed. BEST HOTEL – With the most rooms and most variations in room decor and layout, it has to be Foxwoods. Even with Twin River’s hotel opening, Oxford Casino Hotel open for over a year, Tiverton’s opening including hotel and the opening of MGM Springfield, Foxwoods is still the best choice for hotels. MGM Springfield’s Hotel is one of a kind, and we highly recommend trying a stay there. The many intricacies of Springfield history can be found through out the casino and continued in the Hotel decor. BARS – When it comes to places for libations, there are two types in casinos. First, the typical bar, sometimes with entertainment, usually offers great drinks and dining options. The video poker bar is an important gambling choice provided, usually including slots, keno and sometimes electronic blackjack. Foxwoods & Mohegan Sun tied in this category, and why not with so many bars and VP bars available in their multiple casinos. But it should be mentioned that MGM Springfield’s Walk-up Bar and Commonwealth Bar have terrific ambiance. Now, if only they had playable video poker……. BEST DINING OPTIONS & BEST DINING VALUE – Our voters pretty much nailed this. Mohegan Sun offers the gamut on one property, especially in the area of lower cost eateries. But, I also feel when considering just high end restaurants, Foxwoods would edge out the competition. However, even the fun establishments such as Sugar are in the hefty price range at Foxwoods. Since we visit all New England Casinos, some restaurants need some mention. Tiverton Casino’s Tuscan Chophouse and Italian cuisine at Trattoria Romana are great restaurants with local ties. When it comes to great steak houses, New England’s casinos offer a wide variety of excellent steakhouses. Consider MGM’s Chandler Steakhouse, Jordan’s Steakhouse at Mohegan Sun, Cedars and David Burke’s Prime at Foxwoods, Fred & Steve’s Steakhouse at Twin River and Slack’s Oyster House & Grill at Plainridge Park for your next beef bonanza. Again, NETG applauds the voters in selecting David Burke Prime as outstanding high-end restaurant. It has everything you’d fine in the best eateries in Las Vegas. BEST BUFFET – Mohegan’s Sunrise Buffet is just the best, ’nuff said. ENTERTAINMENT, BEST SMALL VENUE – The Wolf Den at Mohegan Sun is hands down the #1 favorite. The Sun offers outstanding free entertainment on the weekends. But free entertainment has increased at other properties. Foxwoods raised the ante in the Atrium Lounge, Hard Rock Cafe and Centrale. Plainridge Park Casino not only offers good entertainment at their Revolution Lounge, but also at the Loft – including Comedy. Twin River’s Lighthouse Lounge continues to offer great free entertainment. Speaking of comedy, Roar! at MGM Springfield’s Armory and Mohegan Sun’s Comix leads the way. ENTERTAINMENT, BEST LARGE VENUE – Even with the addition of MGM Springfield’s MassMutual Center, Mohegan Sun Arena is still the best venue in New England. BEST SLOTS – I think it’s simple – wherever you win is where your preferred slots are. No one knows the payback percentage, and a slot players play is very short play and really can’t give anyone a good idea on how high the payout is. Most casinos have the same newest slots. But what I found interesting was the lack of Buffalo slots or Wheel of Fortune machines mentioned! Instead, Wonder Woman? who’d a thunk it? BEST VIDEO POKER – Mohegan Sun is the only New England Casino to offer full pay VP – Jacks or Better – at the quarter level up. As long as they offer it, the Sun will continue to be the best VP in New England. 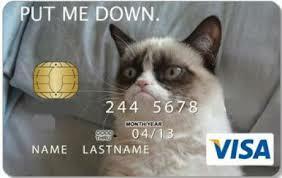 We know from experience at their other properties that Wynn & MGM will never offer Full Pay VP, rarely even at $1 levels. So, this award may be good through 2020. Decent VP paytables can be found at Plainridge Park and Foxwoods. TABLE GAMES – Players of all levels appreciate good rules & low starting limits, especially on traditional games. In New England, Foxwoods and MoSun had this covered, but recently have raised minimums and introduced 6:5 Blackjack. Maine casinos, while having similar rules, lack the amount and mix of traditional table & “carnival” games. Twin River & Tiverton offer table games with slightly higher limits, with most games starting at $10, and MGM Springfield has lowered minimums to be more competitive. While Mohegan Sun won this time, it will be anyone’s game in the future as all casinos seem to be offering the same games, same minimums and same rules. MGM Springfield Poker Room – most comfy in New England? An interesting change has been seen in two areas – favorite game and poker rooms. Craps has taken over as the popular table game in the casino. And when it comes to poker rooms, MGM Springfield, with what is now considered the most comfy poker room in New England, has made a great run at Foxwoods and Mohegan Sun to the point that all thee poker rooms, as well as Twin River Casino’s poker room, are in a dead heat right now. Mohegan Sun is down-sizing its poker room and moving it to a different casino area, which could really change the feel of their poker room. You can bet that poker is alive and well in New England. BEST PLAYERS CLUB – Even with changes, Foxwoods continues to lag behind Mohegan Sun. MLife at MGM Springfield could be a big players club in the coming years with properties on both east & west coast – especially access to Las Vegas Strip properties.